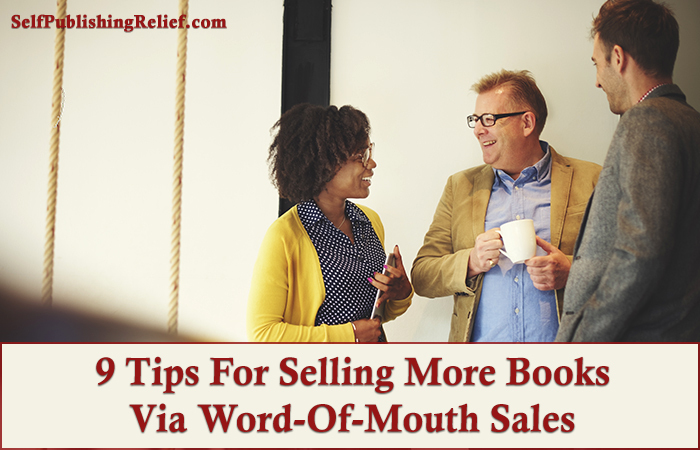 What Are “Word-Of-Mouth” Book Sales? To put it very simply, a word-of-mouth book sale is a sale that is initiated when one reader says to another, “Hey, you’ve got to read this great book I just read.” Most consumers make some of their purchasing decisions about products based on word-of-mouth recommendations (here are more word-of-mouth statistics). Does Advertising Generate Word-Of-Mouth Books Sales? When you see a book ad for a famous author, the publishing company is using the ad as a way of alerting existing fans that a new book is out—not as a way of making new fans. For generating buzz and boosting sales, nothing beats one-on-one recommendations. Some traditional publishers will invest lots of time and money into jump-starting word-of-mouth popularity (here’s how one publisher inspired a successful word-of-mouth campaign). But self-published book authors—as well as traditionally published authors who aren’t lucky enough to rate spotlight status from their publishers—have to drum up word-of-mouth sales without the benefit of an enormous budget and powerful connections. Get the word out on social media. But understand this caveat: While a social media presence is necessary for creating an infrastructure that will support word-of-mouth sales, it won’t necessarily be the driver of those sales. Learn more about how to encourage your followers to actually buy books. Infiltrate a community. If Fifty Shades of Grey hadn’t been born in the thriving world of Twilight fan fiction—inside a ready-made community of voracious readers—would its word-of-mouth sales have been taken off in such a big way? The lesson here for self-published writers is that it’s important to define your niche readers—and then go where they are for word-of-mouth sales. Build interest among independent booksellers. Independent, brick-and-mortar bookstores are still powerful engines for word-of-mouth sales. Booksellers are a community like any other—a group that chats and shares recommendations—except they have the added power of hand-selling books to their customers. Learn more about how to get your self-published book into bookstores. Embrace controversy. For better or worse, controversy sells books. But there’s always a risk that it can backfire. Court book reviews from readers. Some writers will give their e-books away for free or for very little cost in order to get more reviews. Five thousand five-star ratings on Goodreads can go a long way toward converting a possible buyer into an actual reader. Get on the talk circuit. According to The Guardian, Malcolm Gladwell’s book The Tipping Point had middling sales until the author used his gift of gab to stir up word-of-mouth discussions all over the country by presenting talks and seminars. Get opinion-makers to promote you. Writers coveted the Oprah book bump because recommendations from public personalities can be widely influential. But even smaller, regional opinion-makers carry a lot of influence. Try inbound marketing. Often, inbound marketing is a concept that refers to increasing Web traffic, but the concept has larger application. For example, a personal essay published in a major glossy magazine might direct people’s attention toward your book. Smaller articles (and blog posts) can do the same thing. Learn more about inbound marketing for book authors. Use your existing fans to bring in even more fans. Learn more about mobilizing your existing fan base to go out and recruit even more new readers. Let’s start a conversation about word-of-mouth book sales…answer the question in the comments section. Question: When you decide to buy a book, what typically clinches the sale? How do you learn about the book to begin with? And then, what makes you buy it?